Drill down a mile or two into Earth’s crust and you will find solid rock, unbearable heat and little oxygen. Yet it turns out there is also thriving animal life. Just how far down in the Earth’s crust can animals survive? In the dark, hot depths of several South African gold mines, there live some tiny worms that may hold the key to answering that question. These creatures are the deepest living animals that have ever been discovered. No one knows how they got down there, but they could have been living in the mines for thousands of years. Their very existence suggests that complex life can survive far deeper in the Earth than was ever thought possible. In the 1980s, scientists discovered that life can endure thousands of feet beneath the Earth’s surface. However, most scientists believed that the bowels of the Earth could only house single-celled organisms like bacteria. In the deep Earth it is hot and dark, and there is very little oxygen. There is also not much food down there, so any animal making its home in the belly of the Earth would struggle to get a decent meal. One scientist thought differently. Gaetan Borgonie was previously at the University of Ghent in Belgium and is now at Extreme Life Isyensya in Gentbrugge, Belgium. He was convinced that one animal could survive deep down in the Earth’s crust: a nematode worm. That is because nematodes are extremely hardy, able to cope with extreme heat, cold and dehydration. They have an ingenious trick that allows them to survive. Nematodes can transform into a special form called the dauerstage. In this form, they can survive harsh conditions for long periods before reawakening when the going gets good again. This makes them similar to tardigrades: tiny creatures that can survive being boiled, frozen, crushed, dried out or blasted into space by going into a kind of stasis. In the dauer stage, the nematode goes into stasis and its metabolism slows. The stage is triggered by a pheromone and occurs when there is a lack of food, high temperature, or overcrowding. Nematodes in the dauer state are spectacularly resilient. When the space shuttle Columbia broke up after re-entering Earth’s atmosphere in 2003, there were nematodes on board: they survived both the disintegration and the fall back to Earth. Nematodes have populated almost all areas of the world. They can be found in hot springs, deserts, high up mountains and in the deepest oceans. They live in Antarctica, inside the bellies of other animals including humans, and even inside the placentas of sperm whales. Surely if any animal could live deep inside the Earth it would be this hardy worm? Borgonie decided to look for himself, but sceptical grant holders denied him funding. So he teamed up with Tullis Onstott of Princeton University in New Jersey, who also believed that nematodes could exist deep underground. The pair used money from their own savings to travel to South Africa. 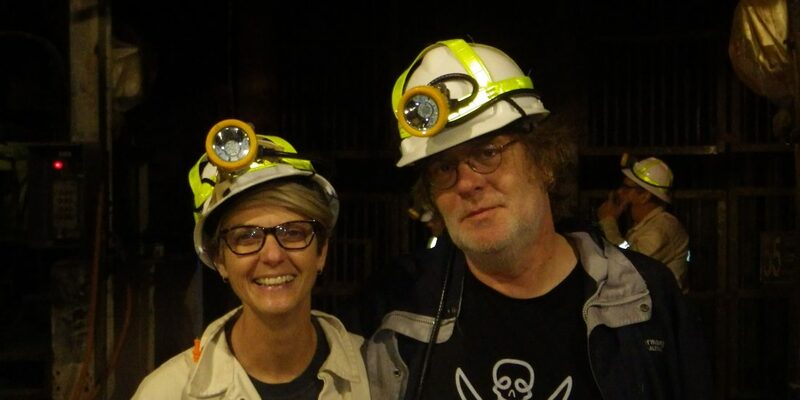 They chose South African mines because they are the deepest accessible places on Earth. Ore miners have drilled to depths of more than 2 miles (3.2km), so researchers can access Earth’s hidden subterranean world. Borgonie began searching the hot and humid mines for life. He took samples of water pouring from boreholes, which had previously been drilled into the rock by mine geologists to check for gas and water pockets ahead of mining operations. He then filtered the water, searching it for life. When he looked under a microscope he found lots of little worms, the first animals discovered this deep underground. Before this, nematodes were only known to live a few dozen feet (tens of metres) underground. This video shows the conditions in which the nematodes are living. The next step was to show that the worms originated in the mine, and had not been accidentally brought in on miners’ shoes or through other contamination. To do this, Borgonie spent a year testing 8,343 gallons (31,582 litres) of water used in mining operations. He also searched the soil near the boreholes. He found no worms in the mining water, demonstrating that the nematodes were not coming into the mine from above. The nematodes in the soil belonged to different species. He also demonstrated that the worms preferred to munch on the bacteria that live in the mine, rather than bacteria from outside, which suggested that the worms were well-established in the mine. The team finally published their findings in 2011. Yet Borgonie did not just find one species of worm: he found four, living in three separate mines. Two species – Plectus aquatilis and an unknown nematode – were found in the Driefontein mine at a depth of 0.6 miles (0.9 km) at 24 °C. They were topped by Halicephalobus mephisto, a new species of nematode. It was found living in the Beatrix gold mine, 150 miles (240 km) south-west of Johannesburg. The worm was living 0.8 miles (1.3 km) underground. At such depths the temperatures reach 37 °C, hotter than most terrestrial nematodes can survive. At the time, many media outlets described H. mephisto as the deepest-living animal known, or at least gave the impression that it was. But it was nothing of the sort. The DNA of another unknown species was found in water 2.2 miles (3.6km) down in the TauTona mine, where temperatures are around 48 °C. This mystery species was the deepest-living animal ever. “Because H. mephisto got all the attention, it stuck that 1.3km was the deepest, but it isn’t,” says Borgonie. What’s more, according to Borgonie the nematodes are not simply eking out a marginal existence underground. They are thriving. The worms feed on snotty layers of goo called biofilms, which consist of millions of bacteria stuck together. Each bacterium is 10 billion times smaller than the worm. The gooey biofilms have attached themselves to the man-made boreholes. This suggests that, by mining the rocks for gold, humans have inadvertently created the perfect habitat for the worms. The low oxygen levels do not bother the worms. Whilst humans need their air to contain 21% oxygen, nematodes are not so picky and can do just fine with as little as 0.5%. The hot temperatures are also not a problem. Even the 48 °C heat of the TauTona mine is nothing to some species of nematodes, which have been found in hot springs reaching 61 °C. It seems the worms had already evolved to withstand heat and crushing pressure, long before they entered the mines. Genetic testing shows that the Mephisto worm is most closely related to Halicephalobus gingivalis; a free-living and bacteria-eating nematode that occasionally parasitises horses, donkeys, zebra and even humans. Similarly, P. aquatilis is a common freshwater nematode. Both have already evolved to withstand low oxygen and high temperatures, so no extra adaptations were needed. “Although conditions in the deep subsurface are extreme they are not that extreme for a nematode,” says Borgonie. He points out that nematodes living in soil may cycle “from scorching sunlight to excessive drought to flooding or freezing” within 24 hours. What is less clear is how the worms got down there in the first place, and how long they have been there. Carbon dating shows that the water the nematodes were found in is 3,000-12,000 years old. That suggests that the worms have been down there at least 3,000 years, but it does not prove it. They may have been washed down through cracks in the Earth’s crust by ancient rainwater. Whatever led to the worms’ exodus from the surface, they have no reason to go back up. As long as there is a constant flow of oxygen and food, and the temperature does not get too high, the worms do well. If the going gets tough they can form the dauer survival stage and wait out the bad times. That implies that animals could be found even deeper underground. The biggest factor in how deep worms can live is probably temperature. Although single-celled organisms can survive at very high temperatures, Borgonie says he would be surprised if anything as complex as a nematode could cope above 60 °C. Whatever the lowest limit is, it is now clear that life runs very deep. More and more examples of living creatures living miles underground are being unearthed. A 2008 study found microorganisms thriving 1 mile (1.6km) under the seafloor, in temperatures between 60 and 110 °C. In 2013, a small snail with a translucent shell was found living almost 0.6 miles (1km) below ground in a Croatian cave system that includes some of the deepest caves in the world. Its see-through shell suggests that it has evolved adaptations to allow it to live in caves. In October 2014, researchers from Yale University reported evidence of bacteria living as deep as 12 miles (19km) underground. They examined rocks on Lopez Island off the coast of Washington, US. The rocks contained unusually high levels of a lightweight form of carbon, which is a hallmark of microbes that produce methane. The study suggests that microbes, buried deep in the Earth’s crust, altered the ancient rocks’ chemical makeup. Meanwhile, Borgonie has continued to look for worms in other deep places. In August 2015, he found 20 nematodes living inside stalactites hanging from the ceilings of mine tunnels. It was the first time nematodes had been discovered living in such a unique environment. One of the worms, Monhystrella parvella, is normally found in the sea – yet there it was inside a stalactite 0.9 miles (1.4km) underground in the Beatrix gold mine. There were no obvious cracks in the stalactites, so the worms must have become trapped inside them when they first formed. Bacteria were also found inside, suggesting that the nematodes had a ready food source. M. parvella also turned up 2.2 miles (3.6km) down, in the same borehole from the TauTona mine that contained the unidentified deepest-dwelling animal. These two worms now share the title of deepest-dweller. Again, the mystery is how the worms got there and where they came from. Being a marine species, M. parvella needs salty water to survive. The stalactite water is salty enough for them, but the mine is almost in the centre of South Africa so the nearest ocean is hundreds of miles away. One possibility is that the worms were carried into the mines 250–350 million years ago, when the area was covered by an inland sea. The salty water could have trickled down into the rocks, bringing the worms with it. Alternatively, South Africa has lots of salt pans, which are regularly visited by large ﬂocks of birds. These birds could have carried the worms from the coast to the surface above the mines. However, Borgonie believes this is unlikely, because these nematodes die if they do not have a constant supply of salt water. It now seems life down there is far more diverse than previously thought. In a paper published today in Nature Communications, he and his colleagues report a host of new discoveries from Driefontein and another South African mine, Kopanang. The boreholes they sampled do not just contain bacteria and nematodes. They are home to a host of other small animals, from flatworms and segmented worms to fungi, microscopic rotifers and even what appears to be a crustacean. The organisms also have a wide range of lifestyles. Some of the fungi appear to be infecting nematode worms, suggesting they are parasites. What’s more, one of the nematodes is a carnivore. Mylonchulus brachyurus is much bigger than the others and survives by eating smaller animals. The ecosystems seem to be broadly similar in all the mines, even though the depths of the samples and the ages of the water vary greatly. Apparently there are certain groups of animals that are good at living deep underground, and their representatives keep making their way down. Almost all the species are known from the surface. Like the nematodes from the first studies, the other creatures do not seem to have had to change themselves much to move down to these extreme depths. These species have evidently evolved to be quite flexible about where they live. The discovery of life so deep underground has torn up the rule book of where animals can live on our planet. If nematodes can live this deep in the Earth, it suggests they could survive in other extreme environments. It also hints that other simple animals could also be living underground. The findings are inspiring others to search for more complex life in extreme places, rather than just looking for bacteria. It seems almost certain that more deep-dwelling creatures will emerge over the next few years. It also suggests that scientists looking for life on other planets should keep an open mind about what they are looking for. Microorganisms are still the most likely thing to find, but it might also be worth looking for simple animals underground.